Monday to Sunday 7AM-7PM we will work with your hours and delivery requiremen­ts. We can also manage packing, labels, documentat­ion and oversize items. TRADEME Single Item deliveries FROM $75 - 1 man moving van - call for FIXED PRICE quote, fee will be based on items and distance. *Prices may vary due to seasonal peaks. Call or email us for all Auckland Furniture Removals Movers Moving, Same day Pickup and Delivery Service for 2 Man Truck, One Man Van, Man with Van, Man and Van, 2 Man Moving Truck from single, multiple items to full households anywhere Auckland Wide. SmartExpress Ltd is covered with Carriers Liability Insurance pursuant to the carriage of Goods Act 1979 excluding household removals. 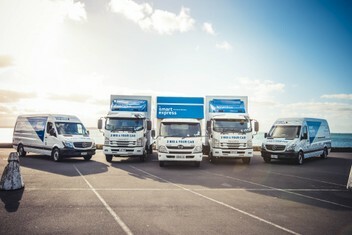 For household moving we can offer you comprehensive transit insurance to ensure household items are adequately insured. Please review our website for details. Excellent service from time of booking till my sofa was delivered. Alex the driver was helpful, well presented and friendly. My thanks for a job well done. Fantastic service. The 2 men that arrived at my house were well mannered and polite. I felt like my precious belongings were in safe hands and the team work was excellent. On arrival at my storage unit, the men took the time to arrange my belongings carefully and with instruction from myself as to where I would like everything. With a bit of trial and error and a lot of understanding everything fitted perfectly. I would highly recommend! Very pleased with the service of Smart Express. They have a professional call centre where all details are captured accurately. The movers were friendly and very efficient. Top service! awesome service, nothing was too much trouble for the two young men. They were always looking out for my welfare at the stressful time. Cannot praise this company too much. Easy booking and great service, Ehsan and Chris were on time, friendly and took extra steps to make sure my purchase was delivered in one piece. Thanks guys! Excellent service. Can't rate highly enough. Was so lovely to have my dad moved across to his new apartment and the van was the perfect size.Was a pleasure to meet Sam and Arthur today. They are an asset to the company for sure.So glad that i booked the move with Smart Express. I will definitely be reccomending and know who to use for future moves. Thank you. Chris or Hilary: Thank you so much for your feedback and recommendation Zacharynz! Chris or Hilary: It's our pleasure Claire! Glad to know everything went well! Great service... turned up on time, handled heavy garden pots carefully, great work guys!! Chris or Hilary: Thank you for this feedback, great to know that they were careful with your garden pots! Chris and Eiken were punctual, fast and friendly. Highly recommended. Thanks for a great job guys! Super friendly staff, fast service and really great price thanks again guys! Will definitely be hiring you guys out again next time we need to move !!! Chris or Hilary: Thank you for this really nice feedback! Chris or Hilary: Thank you so much Voli2 for this wonderful review! We were happy to help you and we hope everything went perfectly on the second job! Chris or Hilary: Thank you Cooper38 for this review and the recommendation! Chris or Hilary: Thank you Morganc for this lovely review, we're happy to know you gave us a call for the 2nd time! Chris or Hilary: Thank you Jadyn, lovely feedback! So love the services of Smart Express moving & delivery. They are pleasant to deal with on phone and their operators are friendly and efficient. Chris or Hilary: Thank you for this nice review Meemie, we do our best to make our customers happy!